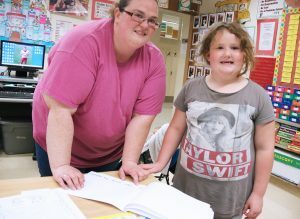 First grader Leah Hilts flashes a smile while taking a break from reading a school project to her mother, Samantha Carlin, during the recent open house. Excitement and laughter filled Fairgrieve Elementary School as students and their families packed classrooms, hallways and special areas during the recent open house event. Students in grades pre-kindergarten through six were thrilled to introduce their family members and other supporters to their teachers and showcase their learning since the beginning of the 2018-19 school year. In Becky Crisafulli’s first grade classroom, students and their parents/guardians and siblings were tasked with a scavenger hunt to become more acquainted with their learning space and academic subjects taught thus far. 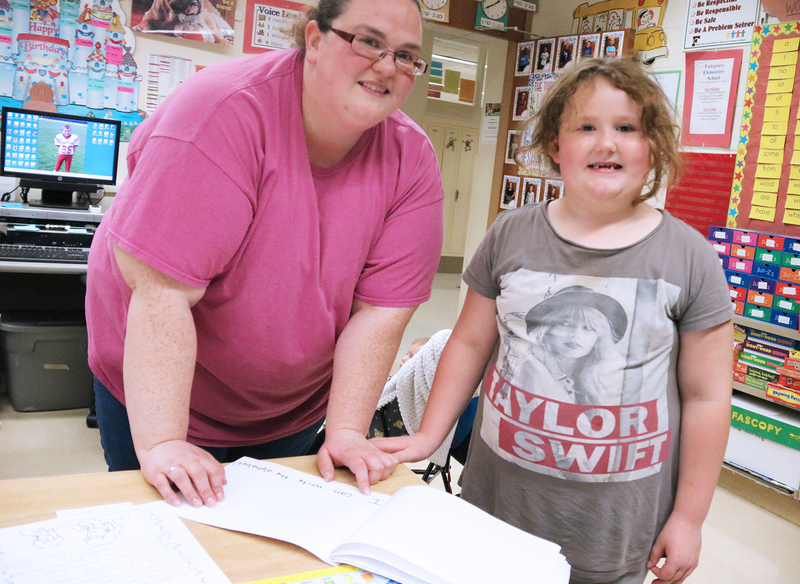 Student Leah Hilts read her handmade “All About Me” book to her mother, Samantha Carlin, before they moved on to other tasks. Down the hall in the library media center, students were abuzz with excitement as they browsed selections of books and trinkets to purchase. Attendees were invited to round their purchase up to the nearest dollar and that money would be donated back to Fairgrieve to help purchase books for future events or programs. Guests were also welcomed by Principal Jean Sampsell, who said she was happy to see several students accompanied by their families for open house. Attendees were also encouraged to visit the school cafeteria where free apples and both school and community information was distributed.